There is no doubt in saying that the Indian food is the best in the World. The main reason behind this fact is that we Indians make a proper use of spices, proteins and nutrients while preparing the dishes. However, you’ll also find a lot of street foods that are high in calories, and a few are not good for health too. These high calorie foods will make you gain weight if consumed very often. Once the fat is stored in your body, it may not be impossible, but needs a lot of time to get rid of it. Since these foods are high in calories, the experts suggest eating no more than 1 serving per day. And if you wanted to have these at any cost, then the best time to eat them is before lunch, so that you’ll have enough time to burn those consumed calories by the end of the day. This yummy spicy fried snack can be found on every street in India, and is one of the Indian foods that is high in calories. Typically, a samsosa contains around 180 calories if non-vegetarian and 130 calories if it is vegetarian. So, it will make you obese if eaten in excess every day. There are both advantages and disadvantages of eating our very famous Chicken korma curry. It is both nutritious and at the same time, a high calorie food. One serving of this curry will provide you with around 800 to 870 calories of energy, which is nearly half of your daily recommended calorie intake. So, if you have this curry twice with some rice and other sweets, you would end up putting on weight in no time. I’m sure you already know that Rice is high in calories, but what makes the Rice Pulao more caloric is the number of spices added while preparing it. Yes, a serving of Rice Pulav contains around 450 calories and is definitely not good for those who’re trying to lose weight. Another problem with this food item is that the spices used in the making of Pulav will increase your appetite and make your tummy growl with hunger. Let it be onion or potato bajjis, the evenings in India don’t end without having this high caloric food. Since, they’re deep fried in oils; it is suggested to stay away from such dishes if you’re on a low carb diet. You get around 190 to 250 calories per 2-3 pieces, depending on their size. Previously, we’ve talked about some spicy foods, but what is more problematic to the weight watchers is the sweets. Yes! This yummy Halwa sweet contains around 570 calories (a piece), which should be taken very seriously. It is the most popular sweet in India, which is made from wheat-flour and sugar syrup. These are usually served warm or cold. You get around 460 calories per serving. It is another popular sweet dessert in India, which is a combination of Juice (Ras) and Cream (Malai). A typical serving of Ras Malai contains approximately 250 calories. This item is one of the most popular dishes in any Indian non-vegetarian hotel. It is very common to see this masala coated stuff in the restaurants. They look very appetizing, but if you carefully look at the number of calories in it, then you’ll have your mind blown. A simple serving (hardly 3 or 4 pieces) contains around 300 to 340 calories. So, does this make you stay away from it? Falooda is another popular Indian recipe which contains around 300 kcl. Though it is enjoyed by many people in India, the dieticians suggest to stay away from this high caloric beverage as it increases your appetite easily. If you’ve been to Mumbai, then you might have heard this name for sure. It is one of the most popular street foods you can find in almost all parts of India. 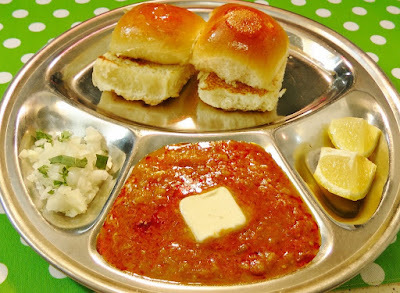 A single plate of Pav Bhajji contains a whooping 620 kcl, which is definitely not suggested for those who’re on a weight loss program. The Chicken usually contains more proteins and is good for health, but when you coat it with thick butter, and then it becomes a problem. This particular Indian non-vegetarian dish is very high in calories and the dieticians suggest to have it only once in a month, if you’re a foodie. A serving contains around 490 calories. This North Indian dish is also very famous in other parts of the India. It may taste good, but contains around 450 kcl in a single serving. So, avoid it if you’re planning to lose weight. This traditional Indian dish is prepared using roasted chicken chunks in a spicy sauce. A very popular dish in both India and abroad. A small bowl of the chicken tikka masala contains approximately 440 to 550 calories, depending on the butter used. This is the most commonly cooked recipe in the Indian households when there is a holiday. The ingredients used are chicken and spices. You’ll be getting around 580 calories per serving. This quick and easy high calorie Indian dish is usually served along with Chapatis or Parathas. 1 medium bowl of Paneer bhurji contains approximately 410 calories. These are just a few most popular Indian dishes that are high in calories. So, it is advised either to avoid them or limit the intake of these foods if you wanted to lose or maintain your weight.